Riga is a brilliant mix of the old and the new. At any moment on a walk through this lovely city, you could glimpse a 700-year-old church next to a modern store next to a new building that was reconstructed to look old. This blend of architecture and interests means there are lots of fun things to do in Riga, Latvia, and there’s something different in every square. With its bustling markets, refreshing open spaces, and pieces of history everywhere you look, Riga quickly became my favorite city on my tour through the Baltics. 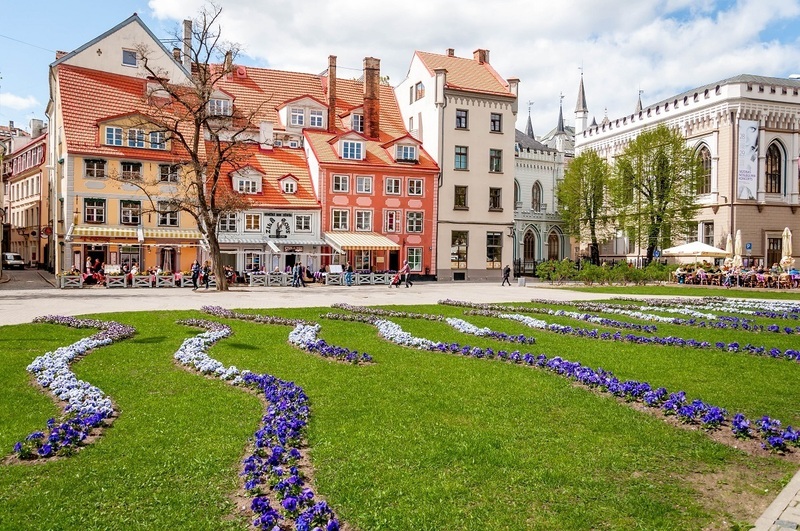 Here’s a look at what to do in Riga when you have a weekend to explore. Built in 1930, the Central Market is the largest in Europe and one of the top attractions in Riga. It serves as many as 80,000 people a day. Central Market is made up of five massive former Zeppelin hangars, each of which sells different types of products. 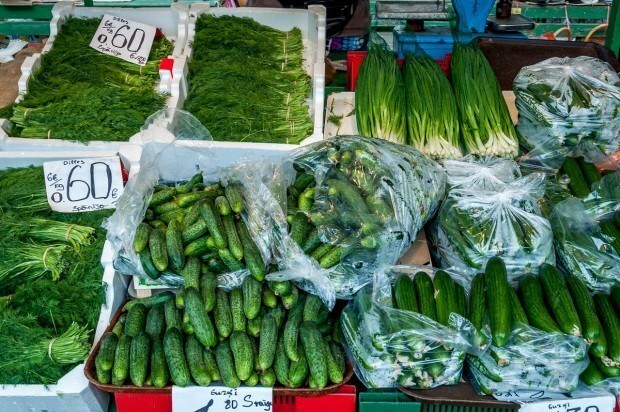 Wandering among the sections, you see everything from pig snouts to flowers to fresh cheese and other Baltic foods. And, of course, pickles. An interesting place for tourists, the market is very much geared toward locals doing their weekly shopping. There are fewer cafes and opportunities to sample items than I’ve seen in other European markets, but if you ask nicely, you might just be able to get a bite of the day’s specialty. 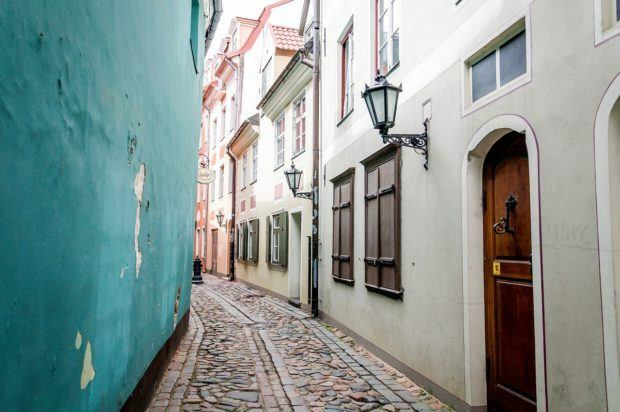 Riga’s walkable Old Town is full of history and lots of beautiful buildings. My favorite was the House of the Blackheads just around the corner from my hotel. Originally built to house the Blackheads guild in the 14th century, the Gothic-Dutch Renaissance building was destroyed by a combination of World War II bombing and the takeover of the Soviets. It was reconstructed in 1999 and is impossible to walk by without taking (several) photos. Other sights worth visiting in Old Town include Riga Castle, Riga Cathedral, and Dome Square. Also in Old Town (but not “old”) is the Museum of the Occupation of Latvia, which tells the story of the 51 years Latvia spent occupied by Germans and Russians. 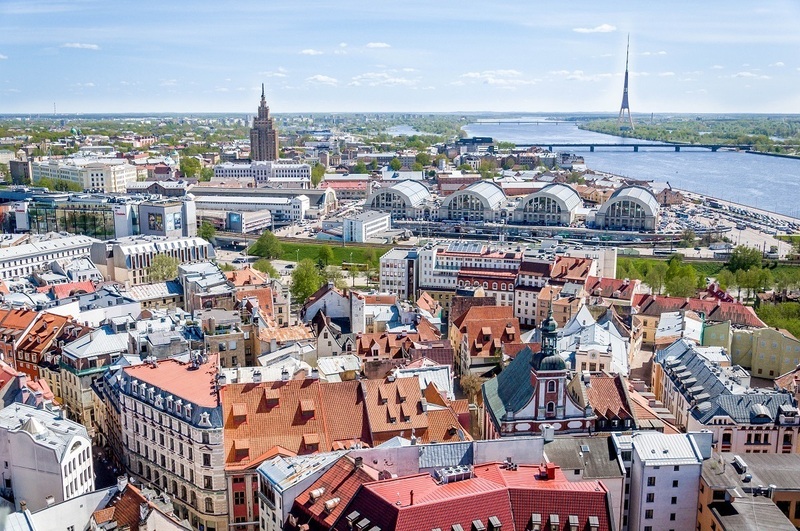 St. Peter’s Church in Old Town offers the best bird’s-eye view of Riga. Take the clanking elevator 235 feet up to the panoramic viewing platform for magnificent views of Old Town, the Central Market, and the river. After seeing the view, spend a few minutes walking around the 13th century Lutheran church. Other than the altar, a bronze candle holder, and the original statue of Knight Roland which previously stood in Town Hall Square, the interior is sparsely decorated. There are regular art exhibits also on display. At €9, the price is a bit steep, but, if the weather is nice, it’s definitely a highlight when you visit Riga. Old Town Riga is a series of squares filled with cafes, shops, and historic buildings. Dome Square has several architectural monuments, including the Cathedral, the Bourse House, and other Riga attractions. Livu Square, once the site of Riga River, has flower beds and outdoor cafes as well as the Small Guild, the Russian Drama Theater, and the infamous Cat House. Nearby, the reconstructed Town Hall Square is a monument to Riga’s past. Take some time out from sightseeing to rest your feet. Grab a seat and try some local food or relax with a cold beverage while you enjoy the ambiance. 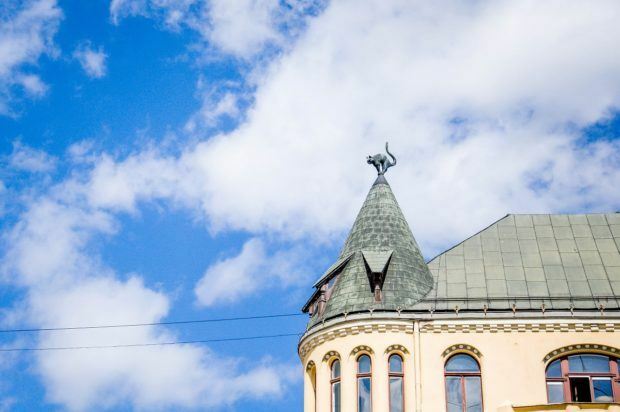 Just one-half mile from Old Town is the Riga’s Art Nouveau district centered around Alberta, Elizabetes, and Strelniku streets. The 100-year-old buildings here are unique, to say the least. They are a true highlight of Riga sightseeing. 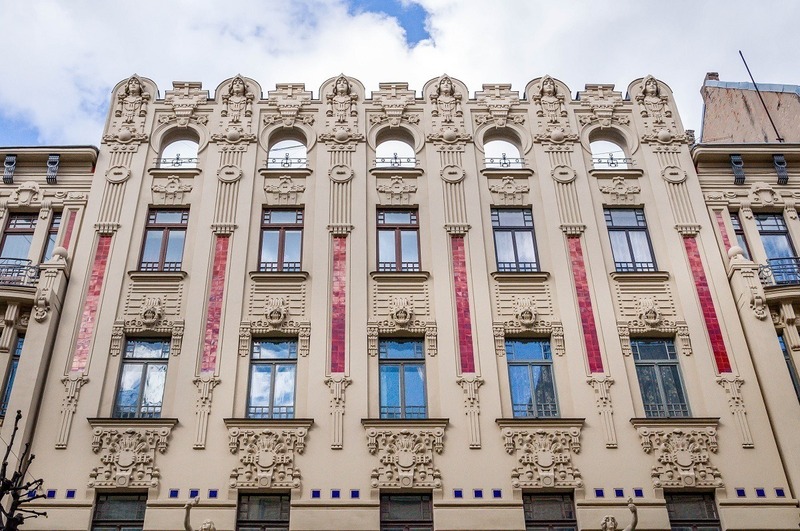 The Art Nouveau movement in Riga (and, indeed, throughout Europe) was a rejection of everything plain, which is apparent as you stroll the streets. As you gaze up at the facades, faces, animals, and unusual things stare back. Look for the details in the buildings and visit the Riga Art Nouveau Museum to learn about the style and its history in more detail. A walk in this historic neighborhood will only take about an hour; add 45 minutes if you plan to visit the museum. The experience is certainly one of the most interesting things to do in Riga, even if you’re not usually excited by architecture. The gleaming golden dome of the Nativity of Christ Cathedral is impossible to miss and beckons visitors inside. 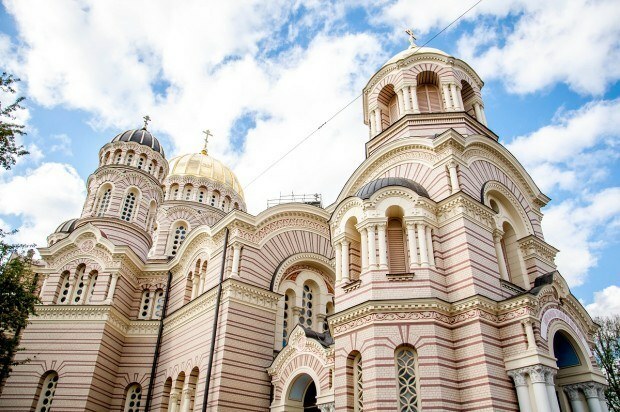 The orthodox cathedral was originally opened in 1884 and served as a house of worship before the Soviets took it over in the 1960s. Under the Soviet reign, this lovely building was used as a planetarium and even a cafe–anything but a church. Now restored to its original purpose, the Cathedral is one of the most interesting places to visit in Riga because the interior is a feast for the eyes. It is brilliantly decorated with Neo-Byzantine art and bright icons. Take a quick peek inside, if only to gaze at the massive, unexpected neon sign, of the kind you might typically expect in a store window. 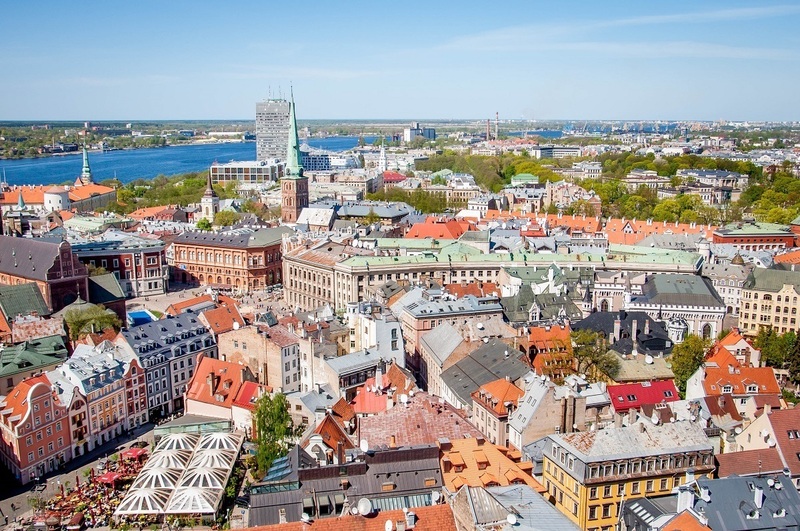 Across the Daugava River about 20 minutes from Old Town is the Kalnciema Quarter, a bustling hub of fun things to do on a weekend in Riga. This area is renowned for its wooden architectural heritage dating from the 19th century but is popular for the numerous cultural and artistic events that happen here. In the Quarter, there are regular art exhibitions, plays, concerts, and family-friendly events. Most of the programs and workshops are free, and the area is always buzzing with activity, welcoming over 100,000 people each year. The Kalnciema Quarter is particularly known for its weekly market, one of the fun Riga activities on the weekends. 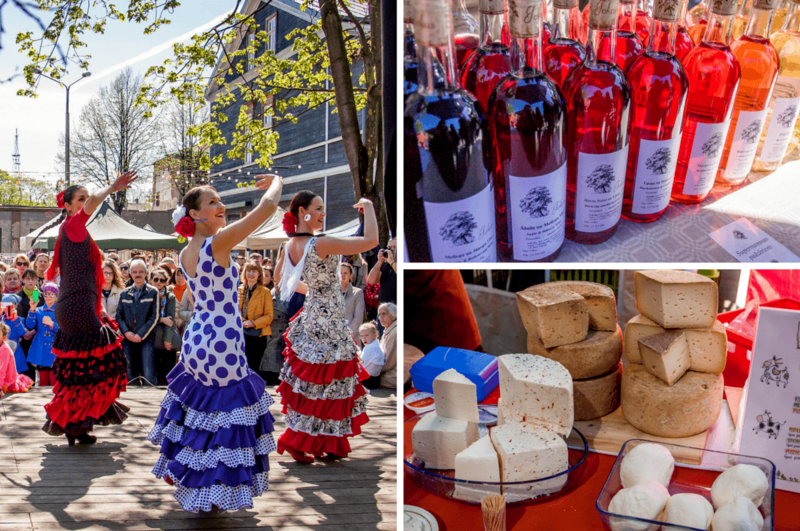 Since 2008, on Saturdays, local farmers and artisans have brought their products to sell alongside the performances that are often part of the themed market. It’s a popular place to be, so get there early if you want some of the great food available. Riga’s traditional drink, Black Balsam, is a 90-proof herbal liqueur. Drunk straight, it’s pretty strong and has a bit of a medicinal taste. 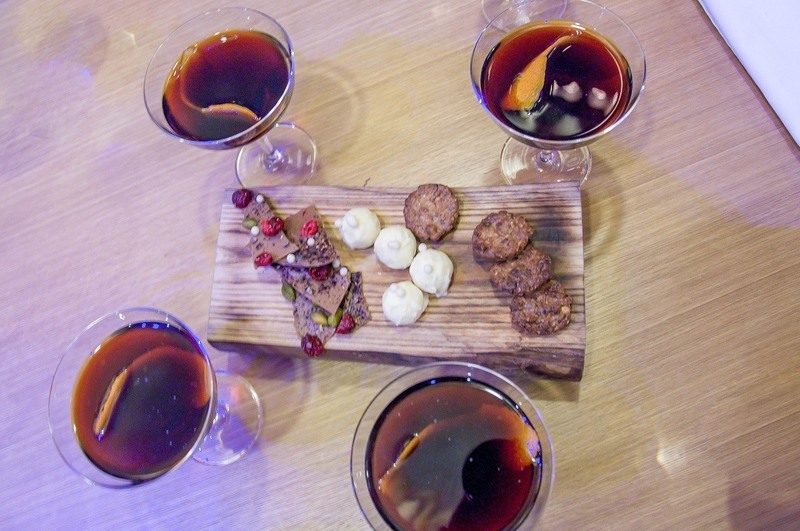 To make it more palatable, it is often mixed with schnapps or in drinks like coffee, Coke, or black currant juice. We enjoyed it expertly crafted in a cocktail. The 140-foot-tall Freedom Monument is impossible to miss on a walk around the city. 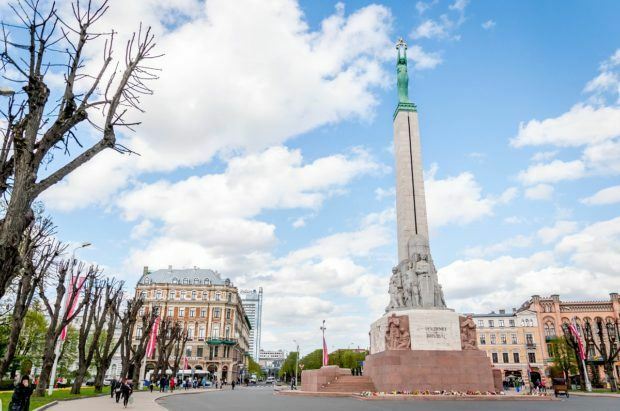 At the junction of Old and Central Riga, the granite and copper pillar celebrates national unity, independence, and freedom in Latvia. Its creation was funded entirely by Latvian citizens as a memorial to those who died in the struggle for independence. The female Liberty at the top–known familiarly as “Milda”–holds three stars that represent the original cultural regions of Latvia. Below her, 55 more sculptures on multiple levels depict Latvian history and culture. Built in 1935, the statue was erected just five years before the Soviets moved in. It’s remarkable that they didn’t destroy it during their occupation, though they did prevent people from visiting. Anyone seen placing flowers at the base was punished. Now, two soldiers stand guard at the Freedom Monument throughout the day, and you can see the changing of the guards hourly from 9 am to 6 pm. The medieval town of Riga was surrounded by strong walls to protect it from attackers, with few entrance and exit points. The only city gate remaining today is the Swedish Gate, which dates from 1698 when the Swedes ruled the city. Immediately behind the walls are some of the small, original medieval streets. Troksnu iela, which was built next to the old city wall in the 13th century, is now a colorful street with a series of bars and cafes. One thing I did not expect to see on my Riga trip was a statue of the Bremen Town Musicians. Bremen, as in Bremen, Germany, nearly 1000 miles away from Riga where there is a similar statue. The Bremen Town Musicians statue is based on the Brothers Grimm fairy tale of the same name. 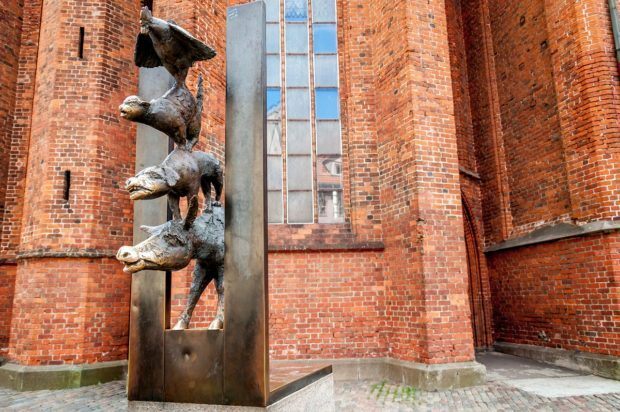 The quartet–a donkey, dog, cat, and rooster-is essentially the symbol of the city of Bremen. In the fairy tale, they become fast friends and set out together to make a living playing music in Bremen. Digging into the history, I discovered that Riga’s statue behind St. Peter’s Church was a gift from Bremen to Riga. Trading partners back to the time of the Hanseatic League, there was always an affinity between the cities. This particular version of the motley crew of Musicians is believed to show the animals symbolically looking through a crack in the Iron Curtain. As in Germany, rubbing the statue is meant to bring good luck. Originally built in 1330, the Sand Tower was one of more than 20 enormous towers that stood as part of the city’s defense system. Over the centuries, it has taken its share of blows and been reconstructed several times. The tower’s current design dates from 1650, around the time when it became known as Powder Tower because it served as a repository for some of Riga’s gunpowder. It soars a staggering 84 feet, and it’s walls are nearly 10 feet thick, enough to withstand the Russian cannonballs that are now embedded in its walls. 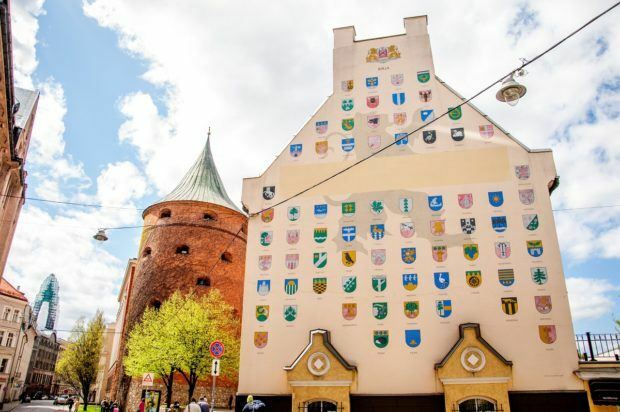 The Powder Tower is now part of the Museum of War, ensuring that Riga’s only surviving medieval round tower will live on. Riga International Airport is the largest airport in the Baltics and has direct flights to over 30 countries around Europe and Asia, including many European capitals. The dominant airline is airBaltic, and major carriers such as Lufthansa and Norwegian also serve the airport as well as low-cost carriers like Ryanair and WizzAir. The airport is about 7 miles from the center of the city. We explored the Baltics as guests of JayWay Travel and stayed at Hotel Justus in Riga. As always, opinions are our own. Have you been to Riga? What was your favorite thing to do there? What do you think about 48 Hours in Riga? Enjoyed this beautiful post about Riga…there are so many places I’d like to, and this is just another one of them! The architecture is beautiful! I’ve never heard of Riga but it seems like a place I’d enjoy visiting! It’s a lot of fun, especially if you have the chance to tack on a visit to any of the other Baltic countries. Plz tell me that how to get latvia study visa ……. i like this country very much….. Sorry, but I don’t know anything about the visa requirements. Yay, I’m so glad you loved Riga! Hopefully word will get out about this awesome city and the tourists will come! It’s a great city. I’d love to come back some time! I have been to Riga twice, once in December and once in July. of my favorite cities to visit. Thanks for a great post go Riga. I’m planning a trip for next summer that includes Latvia and your tips will come in useful. The architecture looks amazing! I never tire to visit Riga. It is so comfortable city. I bet the city is beautiful and the balsam is delicious. Would be fun to see it that way. 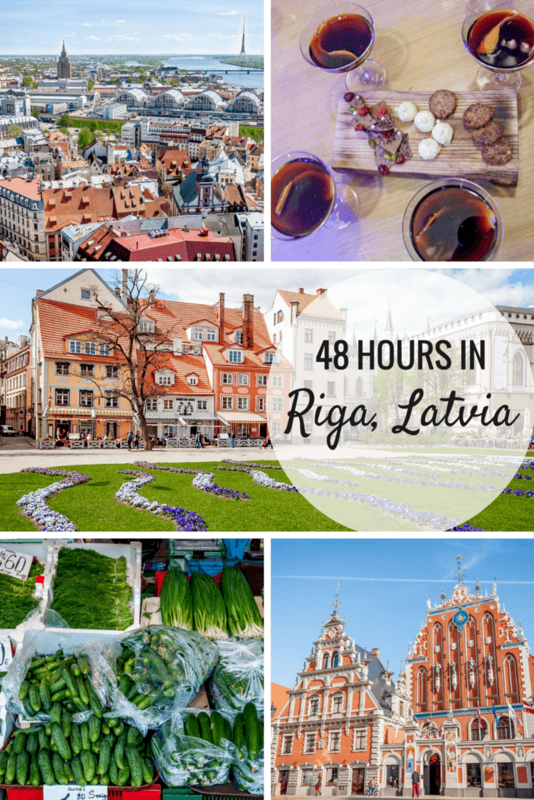 We loved Riga more than any other Baltics capital! Did you like the Black Balsam? Riga was my favorite, too 🙂 I didn’t try Black Balsam straight, but it was great in the cocktail I had. Thanks for including us in your travel itinerary. I never thought to put Riga (or even Latvia!) on my travel to-do list but it definitely is now. Great post! This has made me very excited for my trip to Riga in march which was booked yesterday! That’s great. I hope you enjoy it as much as I did! Riga is high on my list of places to visit for my next Europe trip! Love the old world charm, colourful buildings and I hope to get there soon! Location is the most important for me, I don’t like to waste my precious travel time in public transportation. I better walk and enjoy the view. I stayed in gorgeous place in Old Town and I could just walk everywhere. Old Town is so beautiful and I love the historic buildings. Thanks, Anna. The photo of our cocktails is actually from Restaurant Biblioteka — great place. Definitely need to plan a trip to Riga soon. Obviously this is for 48 hours but how long would you suggest staying? I love to do everything I can when seeing somewhere and am worried about not having enough time. I think three days would give you enough time to see everything and be leisurely enough to enjoy it.